After stepping in your ninth slush puddle of the day, there's a very good chance you're gonna want something to warm you up, and an even better chance you're gonna want that something to be hot chocolate, and an even better better chance you're gonna want that hot chocolate to actually be good and not made by some combination of 1) your microwave, 2) powder that gets in your nose when you open the packet, and 3) a Brita. 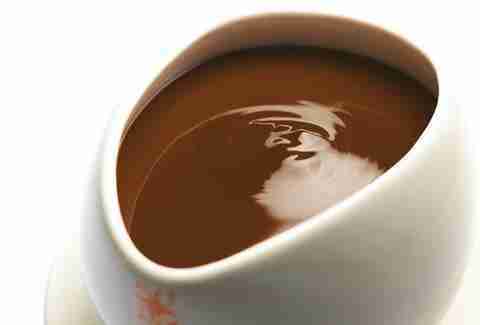 For those times, we've compiled this list of 15 cocoas you absolutely have to drink before Winter ends. The aztec hot chocolate comes in a tiny teacup but packs a not-at-all-tiny chocolate face-punch, thanks to close-to-pure cocoa that has the viscosity of a melted candy bar, but with none of the nougat. Their creamy, must-drink number is a combo of Michael Cluizel chocolate and Battenkill Creamery whole milk -- get it New Mexico-style with some red Hatch chiles and a touch of Ceylon cinnamon. 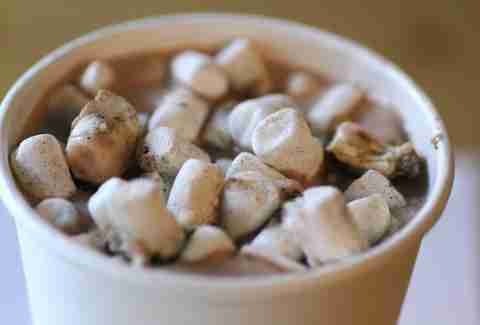 Made from their special Milk Bar fudge sauce and milk, this guy's almost like a liquid version of s'mores: the cocoa is blended with a couple charred marshmallows, heated, and then topped with a slew of others upon request (Editor's note: dude, request). 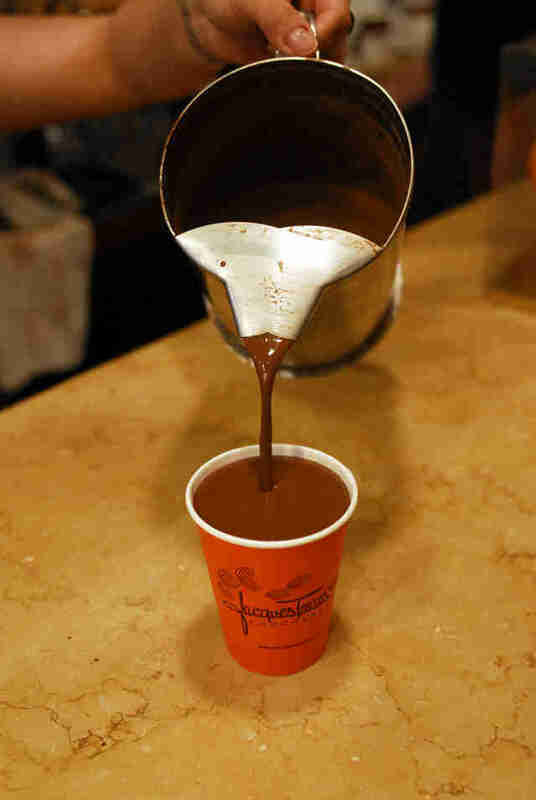 Get there before their famous Hot Chocolate Festival ends and you can get goodness like creamy stout hot chocolate, malted milk hot chocolate, and bourbon hot chocolate, just like mom used to make... for herself... and not share. If you aren't distracted by the super-distracting chocolate pizzas, focus on one of the six-eight rotating flavors of the hotness including the Nutella-y hazelnut hot chocolate, the condensed hot chocolate shot, or the Choco-pops hot chocolate topped with crunchy chocolate wafer balls. 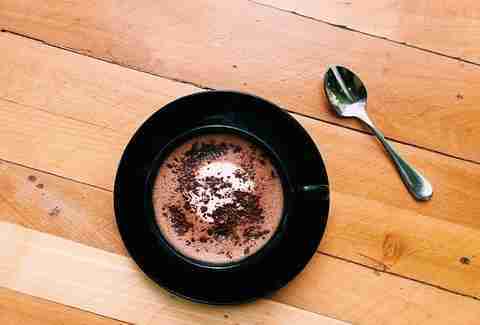 Their ultra-rich and complex Aztec hot chocolate comes three ways: coconut, spicy, or pure. The entire thing is freshly ground right in front of you, which causes the cup to have a nice happy ending of what can best be described as "delicious crunchies". 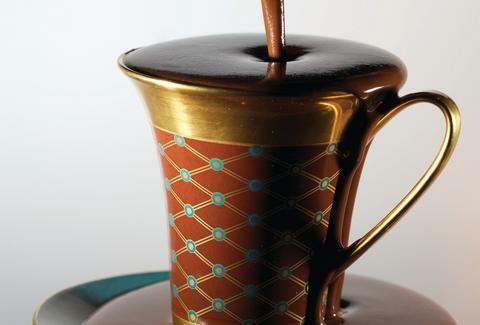 It's thick, it's creamy, and it's amazing: this OG hot chocolate-pusher is making cups the way they should be. Aside from having a s'mores tasting menu (which is amazing), Warmers also does a Spicy Dark Hot Chocolate with cayenne for a little extra heat, and ancho peppers for some added smokiness. Described as "coziness in a cup", this dark (and actually not too sweet) offering is exactly that, with 65% pure dark chocolate shavings whisked into a hot cup of milk. Like that friend from high school with a wave pool in his basement, it's "very rich". Weaving in cocoa, dark chocolate, and a little vanilla, this cup eschews the pure chocolate route for a slightly subtler set of flavors. 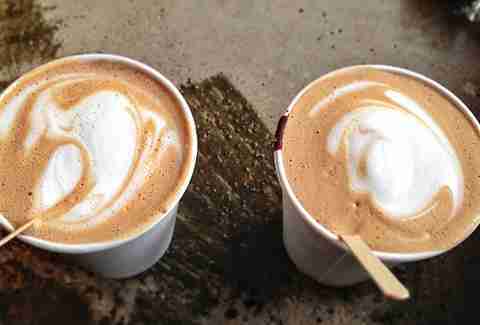 They use 70% "dark single origin roasted chocolate" that's melted down and mixed with steamed milk. It's delicious. Also: there's a spice bar with things like sea salt, ginger powder, and cayenne, just in case. You can hang out all day at this cafe/ bar, and if you do, please drink a million of their hot chocolates, which come in various flavors like mint, white, and, of course, spicy. Every batch here is painstakingly crafted, we're talking 20-30 minutes per. And it's all worth it when you tack on a side of sugary fried dough sticks and start dunking. 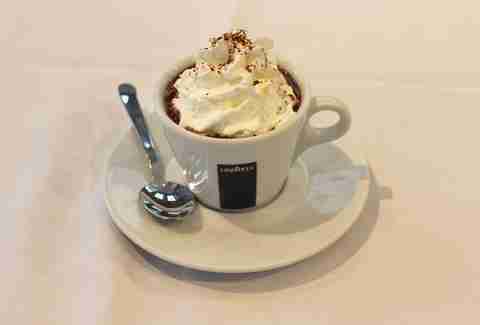 The Italians are no slouches when it comes to hot roasted drinks, and they're proving their sweet game is just as tight as their coffee one with this beauty called the cioccolata con panna, loaded with whipped cream and a small dusting of choco. You could get their chocolate martini (which is excellent), but you should get their hot chocolate, which they'll spike for you, if you ask nicely so... do that. Andrew Zimmer is Thrillist's NYC editor and likes to eat the Swiss Miss marshmallows dry instead of mixing them into his cocoa. Follow him on Twitter and Instagram for more pictures of things with marshmallows on them.